There are plenty of desktop publishing software packages are on the market but most of them have restricted designing options, while others are too expensive for the number of features they offer. Nova Development's Print Explosion has always provided innovative and creative software applications for Mac users. Print Explosion Deluxe 3.0 reaches yet another level of great software for creating customized printed projects. Its applications are compatible with both Intel-based Macs and PowerPC. 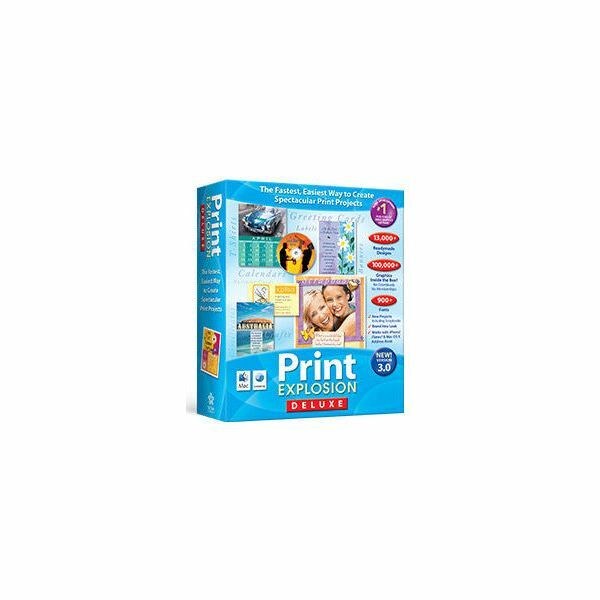 Most of its pioneering features are based on the OS X platform, which creates the most comprehensive printing platform for any imaginable requirement including greeting cards, scrapbooks, brochures, certificates or photo-cards. Print Explosion Deluxe 3.0 touts a simple three step process to create custom projects. First, select a project from one of more than 12,000 professional designs, or create your own design from scratch. Second, customize the design chosen with custom text or with one of the many graphics included with the program. Finally, print it out in dazzling color. Print Explosion Deluxe 3.0 requires Mac OS X 10.2 or later, 512 MB of RAM and a DVD drive. If you're feeling creative, you can create your own design from scratch. However, when you just want to create a project quickly, or if you are looking for some inspiration, there are 13,000 pre-loaded designs to choose from. These ready-made designs cover a wide variety of projects including greeting cards, scrapbook layouts, flyers, calendars, certificates and even labels for anything from CDs to canning jars. Out of the total pre-loaded designs, nearly 5,000 are dedicated to greeting cards only. The idea is to provide a greeting card for every conceivable occasion/reason. Each of these cards can be further customized to suit your personal requirements. All label projects are compatible with industry standard Avery labels. To customize your projects, Print Explosion Deluxe 3.0 includes over 100,000 premium graphics and over 900 fonts to choose from. So many graphics and fonts allow you to freely express yourself no matter what project you are working on. Although projects and shapes can be extensively customized, there is no freehand drawing tool. To achieve using your own drawings, you'll need to create them in an external program and then import the image into Print Explosion. No matter how extensive the library of images is, there will come a time when you need to use one of your own images. Photo Explosion Deluxe 3.0 easily imports images directly from your iPhoto Library. Once the personalization application is running, you can edit, format, shrink, merge, enlarge and rotate text/images without any restrictions. Although Print Explosion is designed specifically for users looking to create print-ready projects, you also have the choice of sharing your projects online, or publishing them in the HTML format to upload to your own website or blog. Create your own original message or choose one of the thousands of quotations included. If you are stuck for what to say, or if you just want the words to have the weight of history behind them, you'll find funny, clever or heartfelt quotes to fit any project. Another useful feature imports play lists from iTunes and automatically prints CD labels. You customize the graphics and text and Photo Explosion taxes care of printing all the musical data automatically. Print Explosion Deluxe 3.0 has an enhanced interface that makes it easy to choose and customize projects. For example, project preview images can be enlarged or shrunken depending upon whether you need to see as much detail as possible to make a final selection, or if you need to see as many possible projects on the screen at once to find that elusive best fit. There is even a Tutorial that gives you an overall feel of using this software by exhaustively explaining some of the more conventional designs. These helpful resources are good enough to convert the most basic of desktop users into competent designers within hours. Print Explosion Deluxe 3.0 is recommended more for those who have some level of dexterity with desktop publishing softwares, but who do not need advanced drawing features or the ability to work with complex images that require layers. In terms of the choice of applications, Print Explosion Deluxe 3 is a solid choice, and when you consider its economical price tag, it is a designing offering that can be a great fit for users looking for a quick, and above all, easy way to created printed projects like greeting cards and scrapbooks.